Tires can be patched or plugged, regardless of their size, and lawn tractor tires can be patched as you would patch a car tire. To do this, you'll have to jack up the tractor and remove the wheel as you would on a car, but first you'll have to find the cause of the leak. If the puncture is on the tire sidewall, or is an actual tear and not a small hole puncture, you should not try to patch or plug it. Instead, the best strategy is to replace the whole tire. Search for the puncture site. You may have to fill the tire up a bit to see where the air is leaking, and you can use a simple foot pump if you don't have a source of compressed air nearby, though it will be difficult to fill the tire up fully without an electric air compressor. Circle the puncture with white chalk, so that you can find it easily when you are ready to plug it. Remove the wheel by removing the bolts around the hub with the socket wrench and pulling the wheel off. 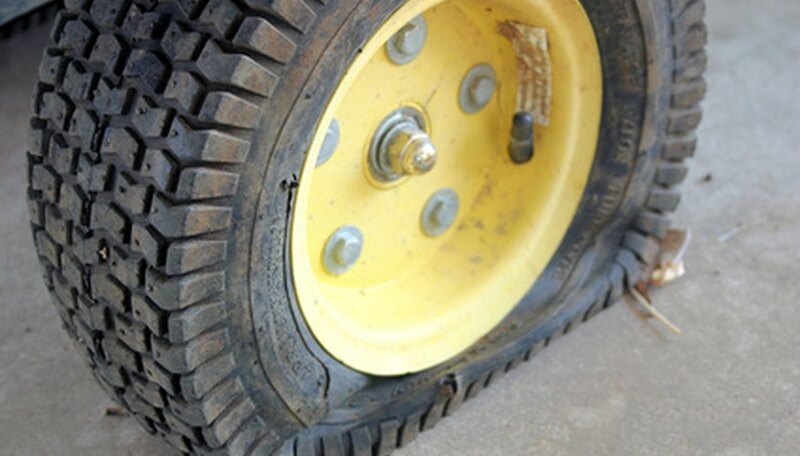 If the puncture is on the outer edge of the tread, you may be able to plug the puncture without taking the wheel off the tractor, but it is often easier to work on the tire when it's off the tractor. Clean the puncture thoroughly, and check that whatever caused the hole is no longer lodged in the tire. Most tire plug kits come with a tool for evening out and slightly roughing the edges of the hole so that the plug can adhere to the tire rubber. Thread your plug through the hole with the guide tool that comes with your kit, and seal the puncture. The plug must penetrate the inside of the tire, and the tail of the plug left outside the tire should be cut off so that it doesn't work itself loose and unseal your tire. Attach the air pump to your tire and refill your tire. It is better to use an electric air compressor to do this, since it will take much less time to fill a tire up all the way using an electric compressor than it would with a manual pump. Fill it to the proper PSI. Reattach the wheel to your tractor, and lower the jack. If you don't have an air compressor where you are fixing your flat, you can use a portable air compressor designed to run off a car's battery to fill your tire to the correct air pressure. Air pressure ratings in PSI, or pounds per square inch, are stamped on the sidewall of the tire, and you can use a car tire pressure gauge to read the pressure as you fill it. ArtsAutomotive.com: Should You Patch Your Tre or Plug it?